Evolution helps every species carve out its own niche within our planet’s huge range of diverse and adverse habitats. And sometimes the features they evolve are truly bizarre. This adaptation occurs because animal DNA can experience random genetic mutations. The mutations that produce features especially beneficial for a particular environment make the animal more likely to survive and pass on its genes. Gradually, those features are passed on over many generations until they become predominant in the species. In this way, unique environments can cause animals to evolve unique appearances and abilities. Whether it’s in response to extreme temperatures, or through competition for mates, some of the most unusual feats of evolution have to be seen to be believed. Here are some of the most eye-catching and impressive examples. 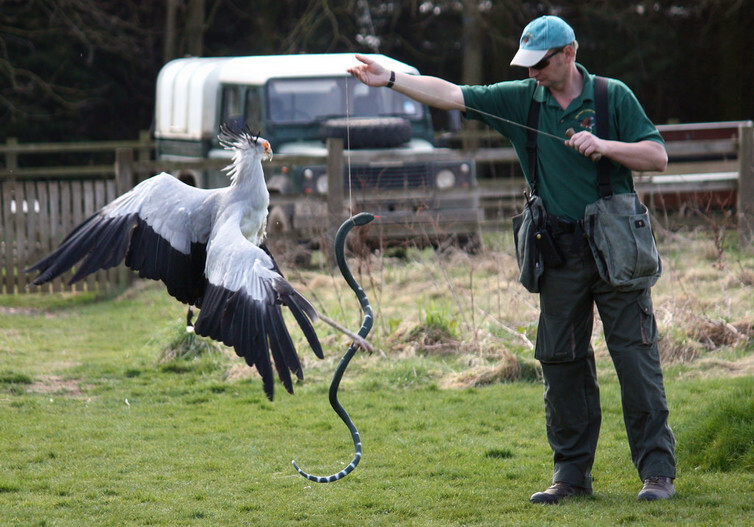 The Latin name for the secretary bird roughly translates as “snake archer”, which gives us a clue to the bird’s diet. But hunting for venomous snakes comes with risks. If a bird were to mistime an attack it could get bitten – with serious consequences. This unusual predator-predator relationship has led the secretary bird to evolve faster attack and response times but also one of the strongest kicks in the animal kingdom. They can kick and stamp on their prey’s head until it is killed or incapacitated, but the first kick is particularly important because it stuns the prey before it has the chance to retaliate. 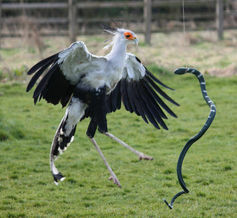 From a standing position, secretary birds can kick with as much force as five-to-six times their own body weight. This is the equivalent of a grown man kicking with 400kg of force. Even more impressively, secretary birds deliver this huge force in a ridiculously short time. The foot is in contact with the snake for just 15 milliseconds. To put this in context, it takes you 150-300 milliseconds to blink your eye. Naked mole rats are definitely bizarre. Seemingly immune to cancer and ageing, they have a life expectancy of over 30 years, an insect-like social society dominated by a queen, and the unusual ability of being able to run backwards as fast as they can run forwards. These features are thought to have evolved to help the animals survive in the hot, humid, underground burrows with sparsely distributed food where they live in west Africa. One interesting feature that doesn’t get as much attention is their curious teeth, which they use to dig with. Their lower incisors are permanently on show on the outside of the animal’s lips and can move independently of each other, almost like a pair of chopsticks. This means that mole rats can dig with their teeth, without getting too much soil in their mouths. 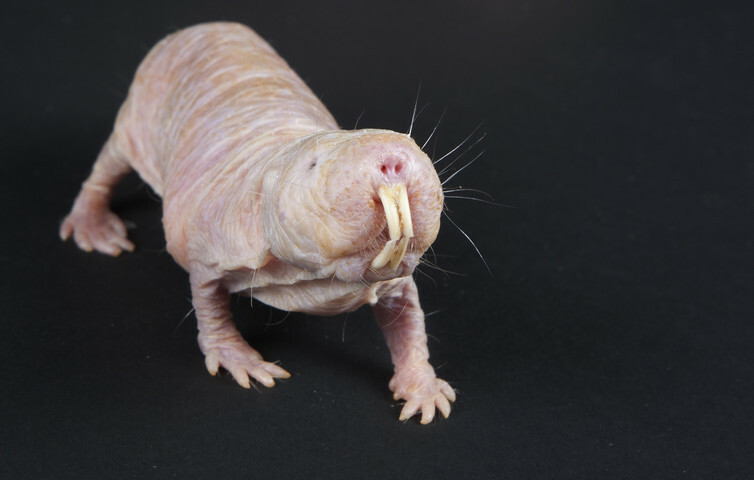 Amazingly, naked mole rats have also been seen inserting the husks of tubers behind their incisors, placing them delicately in front of their lips to act as a face mask against the dirt. Bird eggshells don’t just protect the developing embryo inside but also contain tiny pores to allow oxygen to pass through. Getting the pores clogged with detritus could be a serious hazard and even cause death to the growing chick. 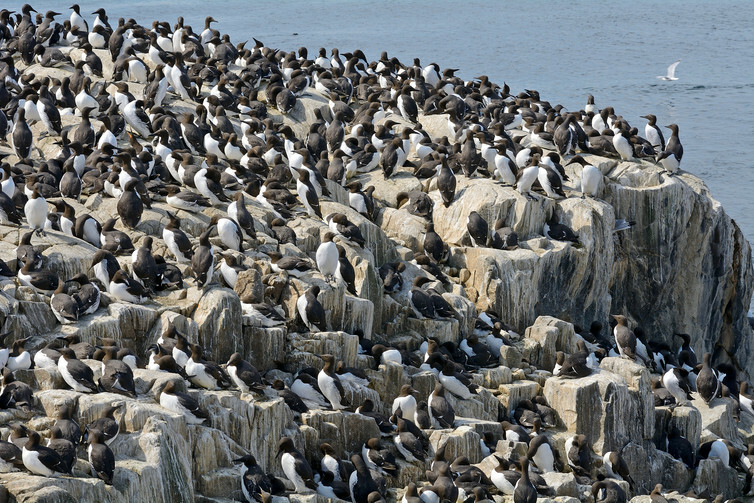 This is a particular danger for guillemots because they live in huge colonies of as many as 400,000 pairs and lay their eggs on bare cliff ledges that become covered in substantial amounts of guano (seabird faeces). To overcome this somewhat extreme environment and to prevent the eggshell pores from getting clogged with muck, guillemot eggs have evolved an ingenious solution. The outside of the eggshell is covered in tiny nano-scale cones. These cones work to make the eggshell surface hydrophobic (“water hating”). Water droplets form a perfect sphere on the surface, rather than spreading and running off down the shell. This structure is very similar to that found on lotus leaves and serves a self-cleaning function. This ensures the correct amount of gases are exchanged across the eggshell and helps the embryo develop successfully. You can imagine the surprise for a group of scientists exploring a small tributary of the Orinoco river valley in Venezuela, who found fish merrily walking up the rocks that fringed the river. These fish turned out to be a new species of catfish that hadn’t previously been described. From above, the catfish’s typical appearance hides an extraordinary secret. Underneath is a giant sucker and an extra pair of fleshy pelvic fins. Together, these two structures allow the catfish to climb up rock faces and out of the water because the specialised pelvic fins are able to move backwards and forwards independently. Climbing is presumably such an advantage for these fish because water levels in the small tributaries are so variable. Their fins allow them to move off in search of other water sources should levels drop too far. And during heavy rain, the fish temporarily can escape from the intense flow. A rare sea creature can teach us about the eye's evolution. Bio science faces a “replication crisis” as big as the one currently blighting psychology.